This book has been getting quite a bit of love from the bloggers I read regularly, so I decided to buy the paperback of it. I was looking for something quick the other day, so I just picked up Descended by Blood. I have to say that I was underwhelmed by this book. It didn't turn out to be what I thought, and unfortunately I didn't enjoy it as much as I had hoped I would. When I started Descended by Blood, I was actually really into it because there was an adorable budding romance with a boy that Brooke has been majorly crushing on for years, Jaren Matthews. Angeline Kace had a good writing style, not the best and still a bit unpolished in some spots, but it carried the story along well. The book opened with quite a rush, and that grabbed me. I liked where things were going in Brooke and Jaren's relationship a lot, and I really liked Jaren! He was sweet, and really caring, and honestly the ideal guy for any girl. But then they hit a snag in the road, namely a vampire assassin that tries to kill Brooke, and all of that goes out the window. Then things happen at lightning speed, and then we're introduced to Mirko, another vampire who is assigned to care for Brooke. Here's where I have the problem. I hate love triangles in general (see my post in which I explain, in various gifs, why). But, I can put up with them if that girl isn't actually dating either of the boys and is just trying to make her decision. But in Descended by Blood, that's not the case. Brooke is literally oscillating between both boys, kissing one in one scene, and then the other in the next. I really just don't jive with that. I hate when people string along others just because they're indecisive. It's literally the ultimate form of douchebaggery. So it irritated me when Brooke would be all, "Oh, wow, Mirko is so hot!" and then in the next train of thought be like "But I still love Jaren, I can't decide who I want to be with more.... so I'll just be with both of them!" I think the really funny (and unbelievable) part was that both boys went along with it! They were just like "I'll fight for you, and I won't give up, Brooke." Ummm, what? Last time I checked, no boy I know would ever let themselves be used like that. It's honestly demeaning to both of them. You're either with one, or with neither, but you can't have both. That's something that really annoyed me about Brooke, and I really wish the love triangle would have been handled differently. On a more positive note, I did very much like the vampires in this book. Unique vampires are hard to come by now a days, and I love it when authors do their research and build a complex mythology around their vamps. That was pretty cool. I liked that they had like these special abilities, and it was interesting to see Brooke learning how to enhance hers. I'm still undecided as to whether I'll read the second. I guess I'll wait a while after it comes out, and see some of the reviews on it. 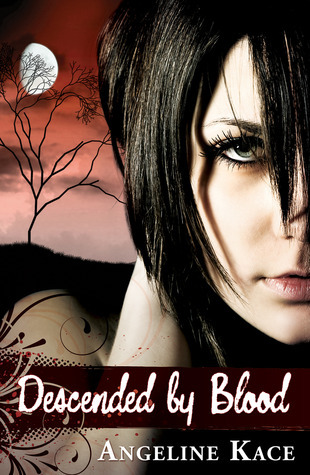 I give Descended by Blood 2 out of 5 stars. I had never heard of Descended by Blood before reading your review but I think it’s safe to say it probably wouldn’t be something I would be interested in. I am totally with you 100% about dragging two guys along and kissing them both. Ugh. Decision making is one thing, but getting involved with both is just in poor taste! Plus, I love your GIFs, gotta lone Jenna Marbles and Kanye’s intense blink. Thanks so much for the review! I appreciate your honest opinions! I thoroughly enjoyed this book and wanted to go directly to the next in the series. Unfortunately, it isn't available yet. This is why trilogies are so upsetting and I usually wait until a whole series is complete before reading the fittest one. The writing flowed well and it really held my interest. I want more.